But last week I started on the journey up the mountain, as Packer describes it. “We are in the position of travelers who, after surveying a great mountain from afar, traveling around it, and observing how it dominates the landscape and determines the features of the surrounding countryside, now approach it with the intention of climbing it” (20). …before we start to ascend our mountain, [we need] to stop and ask ourselves a very fundamental question-a question, indeed, that we always ought to put to ourselves whenever we embark on any line of study in God’s holy book. The question concerns our own motives and intentions as students. We need to ask ourselves: What is my ultimate aim and object in occupying my mind with these things? What do I intend to do with my knowledge about God, once I have it? For the fact that we have to face is this: If we pursue theological knowledge for its own sake, it is bound to go bad on us. It will make us proud and conceited. The very greatness of the subject matter will intoxicate us, and we shall come to think of ourselves as a cut above other Christians because of our interest in it and grasp of it; and we shall look down on those whose theological ideas see to us crude and inadequate and dismiss them as very poor specimens. For, as Paul told the conceited Corinthians, “Knowledge puffs up…The man who thinks he knows something does not yet know as he ought to know” (I Corinthians 8:1-2). To be preoccupied with getting theological knowledge as an end in itself, to approach Bible study with no higher a motive than a desire to know all the answers, is the direct route to a state of self-satisfied self-deception. We need to guard our hearts against such an attitude, and pray to be kept from it. As we saw earlier, there can be no spiritual health without doctrinal knowledge; but it is equally true that there can no spiritual health with it, if it is sought for the wrong purpose and valued by the wrong standard. In this way, doctrinal study really can become a danger to spiritual life, and we today, no less than the Corinthians of old, need to be on our guard here (21-22). So why do you study? Is it merely to know all the answers? Is it only to enable yourself to debate with others? Is it to gain applause for your knowledge? Or is it to know Christ intimately and walk in obedience to Him? The former motivations will bring death and sickness to your soul, the latter will bring life and health. Ahh, nicely put. Would you believe that I saw that very book three weeks ago at a used bookstore, thought it would be a great book to read, bought it and left it in the bag. Two days ago I saw the same book at goodwill, thought it would be a nice book to read, bought it and brought it home and just retrieved it from the back seat of my car last night only to find that I actually have THREE used copies of this same book! Do you think my Father is trying to tell me something? I am not “theology”minded. In fact, I have intentionally stayed away from being drawn to theology for fear that I may end up legalistic or pharisee minded ( I’ve had bad experiences with both) and become a “grace stealer”. Oh how far I have to go. I am encouraged though, I just thumbed through this book and ended up on Pg. 128. I think I’ll start here and then go to the beginning of the book. Thanks for such an open minded, honest blog. Blessings to you. 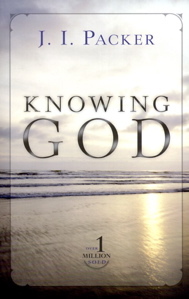 I am glad you are beginning to read ‘Knowing God.’ It has come well-recommended for over 20 years by a large portion of the Christian community. I trust the Lord will use it for good in your life. I read Knowing God 30 years ago, but only read Packer’s excellent “Keep in Step with the Spirit” a year or two back. It is a great study in things connected with the Holy Spirit. It is sensible, and helpful. Packer will irritate charismatics for not being completely pro-charismatic and irritate non-charismatics for not coming down as hard on the Pentecostals as they might have liked. But it is a fair, biblical, challenging book, well worth your time. Thanks for the word about Packer’s “Keep in Step with the Spirit.” I bought it a few months ago but have yet to read it. Your comment may push me over the edge!